Gerald Huggins writes at HBCU Gameday that four players who attended historically black colleges have been invited to the NFL Scouting Combine, which begins later this month. “All three of the HBCU combine invitees from 2016 (Javon Hargrave, Ryan Smith, and Temarrick Hemingway) were selected in the NFL Draft,” Huggins writes. The NFL released its official list of invitees to the NFL Scouting Combine on Wednesday. Of the 330 players invited to the combine, four of the players attended HBCUs. 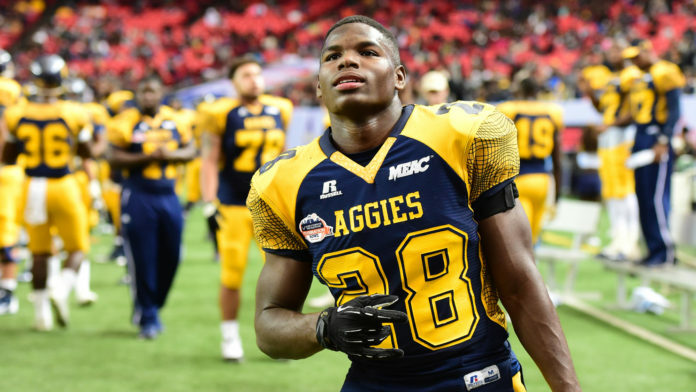 The MEAC has two representatives in Tarik Cohen, the electrifying running back from North Carolina A&T and Javarius Leamon from South Carolina State. Also represented is Tennessee State with defensive back Ezra Robinson and offensive guard Jessamen Dunker. Cohen, a 5’6 workhorse for the Aggies, is the MEAC’s all-time leading rusher (5,619 yards) and three-time conference Offensive Player of the Year. He rushed for 1,588 yards and 19 touchdowns on 212 carries in 2016. He has made some comparisons to Darren Sproles because of his size and playmaking ability. Robinson, a 5’11 cornerback for the Tigers, was a transfer from Michigan State. He left East Lansing in 2014 and instantly became an impact defensive player for the Tigers. He started every game in 2016 and had a highly productive year with five interceptions, returning two for scores and eight pass breakups. Leamon, listed at 6’7, 315 pounds, is the size that pro scouts are looking for in offensive tackles. Leamon was a first-team All-MEAC selection as the Bulldogs starting left tackle in 2015 and was second-team All-MEAC in 2016. Dunker, a Florida transfer, earned first-team All-OVC honors last year. Head over to HBCU Gameday to read more.